27 July to 2 September 2014Summer has begun well. There have been lovely summer days, beautiful summer flowers and we have some wonderful paintings for summer. 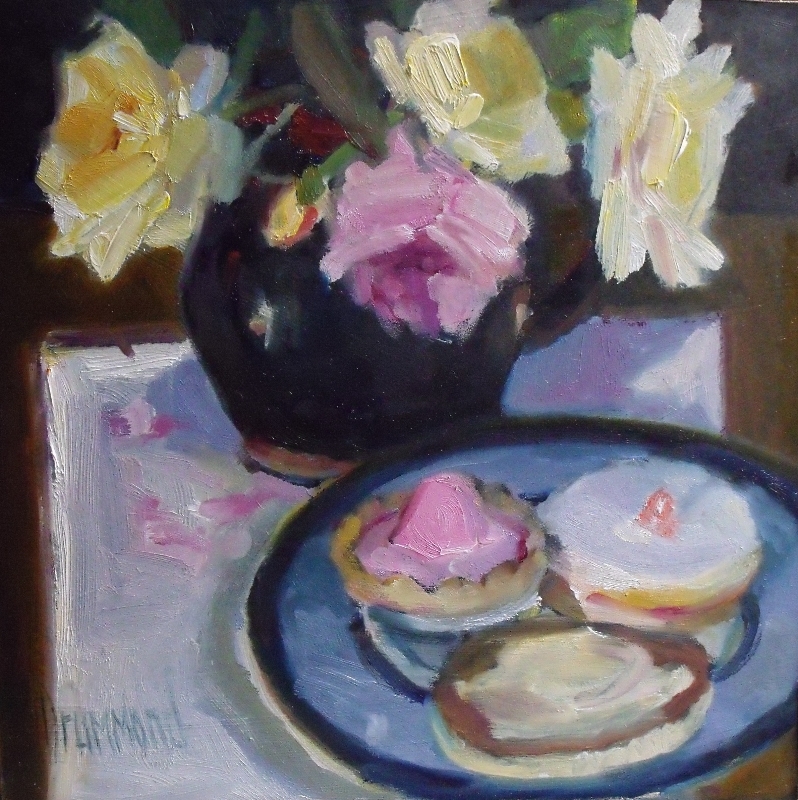 ‘Time for Tea’ above is just one of Marion Drummond’s paintings in our Summer Exhibition. She is one of the host of artists taking part in our annual Summer Exhibition. Join us and enjoy new work by artists including Walter Awlson, Chris Bushe RSW, Catriona Campbell, Jane Charles, Tim Cockburn, Kirstie Cohen, Moira Ferrier RSW, Claire Harkess RSW, Claire Harrigan RSW, James Harrigan, Wendy Houston, Susie Hunt, D.E.Johnston, Elena Kourenkova, Sophie McKay Knight, Peter Layton, Jennifer Mackenzie, Charles MacQueen RSW RGI, Suzan Malcolm, Mhairi McGregor RSW, Rob Newton, James Orr, Barbara Robertson, Patricia Sadler, Joe Smernicki, Marion Thomson, Alan Watson, Maggie Williams, Christine Woodside RSW RGI, Steve Wrightson and Marie Louise Wrightson. You are invited to the opening of the exhibition on Sunday 27 July from 2 pm to 5 pm. Do join us if you can for strawberries and fizz. It is likely to be a few days after the exhibition opens before the paintings go online at tolquhon-gallery.co.uk but if there is an artist who particularly interests you, please contact us and we shall e-mail details of their work as soon as we can. If you are free on 16 and 17 August, why not join D.E.Johnston’s Watercolour Weekend Workshop: ‘Watercolour Landscape – Painting Foregrounds’. Just a few spaces remain in this workshop which provides an ideal opportunity to learn from a master of watercolour. Foregrounds are generally regarded as ‘difficult’ but David Johnston will give demonstrations and help you develop techniques to interpret a variety of landscape subjects. If you are interested in further art classes at Art OnThe Green, a new series of weekly classes will begin in September. You can find full details of all workshops on our website or you can give us a ring or email for further information.